The sun rising in the morning and setting in the evening, especially when there are some clouds in the sky is the most magical time of day. I love being on the beach at that time to capture some magical photos. Here in Uruguay the local people have a tradition when it comes to sunsets. Little groups of people gather at the beach to watch the sunset and when it has finally disappeared from sight altogether everybody claps their hands. I had never witnessed this before anywhere in the world. It is most unusual but I think it rather nice. its a way of saying "thank you" to the miracle of nature. 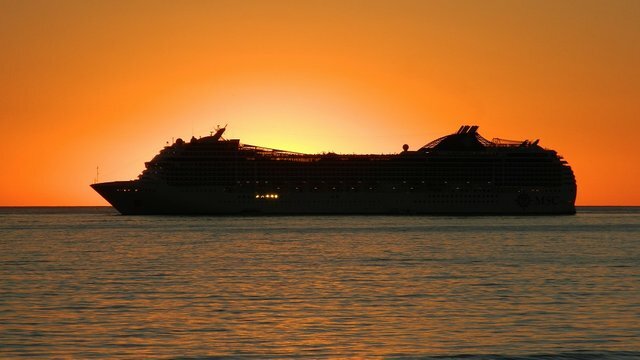 Every summer season, which extends from December to end of March we get the cruise liners stopping in the bay. This was one of them and I managed to capture a nice shot of it just as the sun was setting behind it. Beautiful photo! It's done in Hawaii as well. They also usually have a ceremony for sunrises. thank you so much for the compliment @starjewel, and yes it is a nice tradition, I have been there a few times and its really lovely feeling such gratitude!